I have been trying for several days to connect orbbec astra pro cameras with unity3D in ubuntu 16.04, but without success. I installed the orbbec SDK and ran all samples without problems after continuing to install all the necessary libraries and with the help of several posts from this forum ( https://3dclub.orbbec3d.com/t/astra-sdk-with-unity-dll-errors/1336/3?u=fmesteban ). 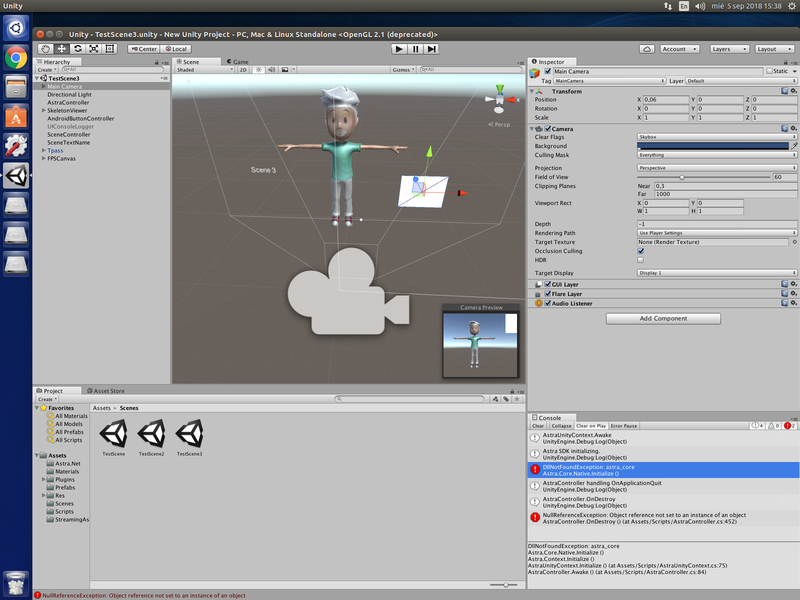 I also downloaded the unity packcage from the orbbec page and ran the 3 scenes that come but the camera doesn't detect. In Windows I haven't had any problem with Unity recognizing my camera and running the avatar or any of the 3 example scenes. So, I downloaded the AstraSDK zip package and extracted it on my 64 bit Window 8.1 machine. I've connected the orbec Astra camera to USB 2.0 and opened "SimpleColorViewer-SFML.exe" from "bin" folder. It opens a large window that is all black. Basically there is no camera feed being shown on screen when I open any .exe files from that folder. There's no LED glowing on the camera either. Am I missing something? Hello. I'm doing a project for my thesis work (Unity + Orbbec Astra Pro cameras). Is it possible to use two or more Orbbec Astra Pro cameras in Unity? I tried to run the project for multicam body tracking "AstraDotNetDemo" for Microsoft Visual Studio 2017 (https://github.com/bibigone/AstraDotNetDemo), but it works very unstable. If there are similar analogs for Unity? Thank you! Hello, I'm beginner with Orbbec. I have a problem in the rotation of character. When the character is backwards to the camera, the skeleton working bad, is generate a mirror effect. How I can solve this?